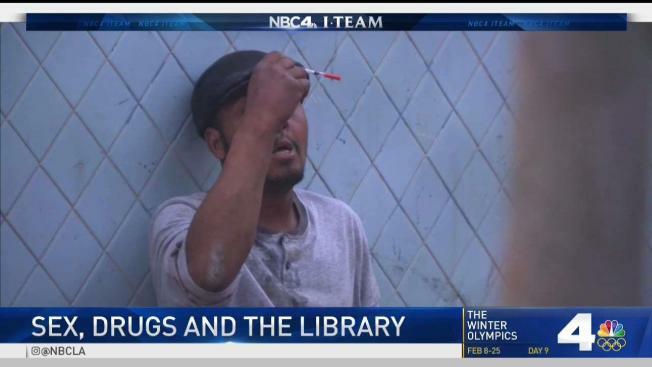 Mayor calls ongoing problems "unacceptable"
Los Angeles Mayor Eric Garcetti said "we have to do better" to curb drug use and crime at LA's public libraries, in response to a new NBC4 I-Team investigation. Last November, after the I-Team aired video of people masturbating and routinely doing drugs around city libraries, the Mayor and the chief of the LAPD vowed to curb these rampant crimes. Chief Charlie Beck said he was adding "additional resources" to "do a better job" of securing libraries. So for the last two months, the I-Team resumed surveillance outside libraries. In recent weeks, our undercover cameras recorded a man shooting what appeared to be heroin, and several others smoking what appeared to be crystal meth, outside Francis Howard Goldwyn-Hollywood Regional Library. When asked if he would want his child to walk by that kind of drug use on the way into a library, Mayor Garcetti responded, "Of course not, of course not." The Mayor's office recently told the I-Team "The LAPD has significantly increased deployment of additional officers ... to library locations citywide." But since that interview, the LAPD has repeatedly declined to tell us specific numbers of new resources deployed now to libraries, claiming it "would compromise the mission as well as officer safety." Last November, before the I-Team's original report aired, the LAPD did provide exact numbers of officers deployed. Within the past 24 hours, the LAPD sent the I-Team an email that still didn't reveal the exact number of police officers and guards currently assigned to libraries. It did show the total number of times officers and guards were deployed to libraries since the NBC4 investigation first aired, even if they visited for just a few minutes. "I respectfully disagree," said Mayor Garcetti, when told the police department declined to provide specific deployment numbers. Asked to find out for NBC4, the Mayor said "Absolutely, I will." The I-Team is still waiting for the Mayor's office to deliver those numbers. One neighbor who lives across the street from Goldwyn Library, Frank Gulli, told the I-Team, "crime [outside the library] is down from three months ago, but just a little bit." Gulli and others in his senior apartment building say they've been watching the police presence outside Goldwyn Library since the I-Team first exposed crime here three months ago. He says it does appear police show up to the library more frequently, but he says they often stand around and chat with each other instead of patrol the area. "I don't get the impression they're doing any kind of enforcement. It actually does look really staged," Gulli says. The I-Team has also been watching police activity around several libraries. On some days, armed officers come and go all day long, some staying for hours; on other days, the officers will stay for less than ten minutes. Private security guards and unarmed L.A.P.D. "security officers" are often stationed inside the branches, just as they were when NBC4's original investigation aired. On several occasions, the I-Team has watched two officers arrive in separate squad cars, go inside the library for several hours, then take off for the rest of the afternoon together in one car, leaving an empty marked car parked out front. "Those cars don't really serve any purpose because there's nobody in them!" said another neighbor named Harriet who lives across the street, and can see the library from her balcony. Residents also say the LAPD hasn't kept its promise to have library officers and guards "get out and work the neighborhoods," as Chief Beck promised last November. On some days, the I-Team's cameras have observed officers patrolling the areas surrounding libraries, but on other days, hours pass without any officers or guards appearing outside. That's when drug users often reappear outside the branches. Mayor Garcetti said there's "no question" that LA's libraries are safer than they were last year, pointing out new statistics that show arrests are up in recent months. "I care about this deeply, not just as a mayor, but as a parent," he added, saying he would not want his child to walk by people openly using drugs on the sidewalk outside the library. "This is a terrific system," Garcetti told the I-Team. "We have to make sure, though, [that] these incidents — which are few and far between — are reduced and reduced and reduced."